Start a career in a rewarding, high-demand sector of health care: join the Northern Arizona University Physician Assistant (PA) program, Arizona’s only public university PA program. You will study in the state-of-the-art Phoenix Biomedical Campus, a 30-acre medical and bioscience campus in downtown Phoenix. The program operates in collaboration with the University of Arizona – Phoenix College of Medicine. Upon completion of the program, you will graduate with a master’s degree in Physician Assistant Studies (MPAS). The program’s location in Phoenix will offer you real-world education in well-established hospitals and clinics, and in cooperation with other public university colleges of medicine, nursing, public health, and pharmacy. 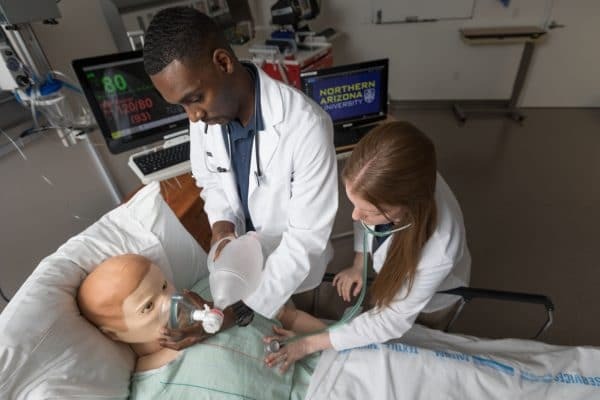 The mission of the Northern Arizona University Physician Assistant Program is to recruit individuals of the highest possible quality from diverse backgrounds and life experiences to the profession. We will equip you with clinical and professional knowledge, skills, and abilities to provide high-quality, compassionate medical care for the people of Arizona. Military corpsmen have played a key role in the creation of the physician assistant profession and this program honors that role in its support of veteran applicants and enrollees. The program provides military veterans a cost-effective transition from military service into a new service career as physician assistants. NAU’s Office of Military and Veteran Affairs and Financial Aid Office offer assistance with military education benefits, loans, and scholarships. The Accreditation Review Commission on Education for the Physician Assistant (ARC-PA) has granted Accreditation -Continued status to the Northern Arizona University Physician Assistant Program sponsored by Northern Arizona University. Accreditation-Continued is an accreditation status granted when a currently accredited program is in compliance with the ARC-PA Standards. Accreditation remains in effect until the program closes or withdraws from the accreditation process or until accreditation is withdrawn for failure to comply with the Standards. The approximate date for the next validation review of the program by the ARC-PA will be September 2025. The review date is contingent upon continued compliance with the Accreditation Standards and ARC-PA policy. Of our first graduating class of 2014 (N=24), 96% took their first job in Arizona, 65% took their first job in primary care, and 52% took their first job in a medically underserved or rural community. In our second graduating class of 2015 (N=24), 88% took their first job in Arizona, 54% took their first job in primary care, and 46% took their first job in a medically underserved or rural community. In the most recent academic year, 55% of the students’ clinical rotations were completed in a rural or medically underserved practice in Arizona. Combining data from the first two classes of graduates (N=48), 92% took their first job in Arizona, 58% took their first job in primary care, and 48% took their first job in a medically underserved or rural community. Almost 70% of our current first and second year classes consist of individuals who are economically or educationally disadvantaged, first generation college attendees, military veterans, or are in an under-represented minority. The 24 graduates of the Class of 2014 attained a 96% first time pass rate on the Physician Assistant National Certifying Exam (PANCE). The 24 graduates of the Class of 2015 also attained a 96% first time pass rate on the PANCE, and all 48 NAU PA program graduates have passed the PANCE and are practicing as PAs. Both graduating cohorts’ first time PANCE results equaled or exceed the national average. The NAU PA Program had an attrition rate of 4% (1 student) in each of the first two graduating cohorts, less than half of the national average deceleration/withdrawal/dismissal rate of 9.2%. The NAU PA Program graduated its first cohort in August 2014. The 24 graduates of the Class of 2014 attained a 96% first time pass rate on the PANCE, and the 24 graduates of the Class of 2015 also attained a 96% first time pass rate. All graduates of both the Class of 2014 and 2015 have subsequently passed the PANCE and are practicing as PAs. The Class of 2016 attained a 100% first time pass rate on the PANCE. The Class of 2017 attained a 98% first time pass rate on the PANCE. The Physician Assistant National Certifying Examination Five Year First Time Taker Summary Report for the Norther Arizona University PA Program can be found here. Are you interested in becoming a preceptor for our program? If you have any questions, or you wish to receive email updates, send your request to PAprog@nau.edu. Northern Arizona University named a ‘Best College’ for military vets, according to Military Times. Read more here.